I love the summertime. That’s when I see people getting out having fun and doing all sorts of things. It’s also when my mind can relax enough to relive summers past. I tend to be caught off guard but excited when memories come to me in the form of sounds and smells. Summer has been a source for past memories for me for a long time. Just today I was standing in my kitchen, trying to figure out the best way to cut into a humongous watermelon. I wanted to do it right because I know I was taught this somewhere in my past. There was a bit of self-imposed pressure from that first watermelon of the summer. I don’t remember watermelon being this big! I sized it up and went at it. Down the middle right along the north and south poles. 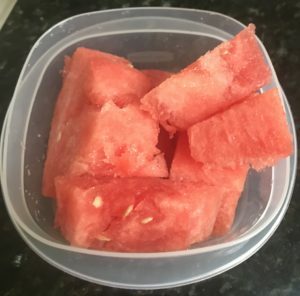 The crisp sound that the knife made as I cut into the watermelon, along with the juice dripping on the counter, had my mouth salivating in anticipation. After I had cut it into manageable pieces, I had to resist taking a bite. Everyone knows that watermelon needs to be ice cold to enjoy fully. It’s kind of a ritual. A few hours later, I took my precious bites of summer onto the patio to enjoy. And just like that, with that first cold sweet bite, I was back in my Mama’s kitchen, it was hot and she had sent me outside to enjoy my special summer treat. I was singing some childish made-up song that came to me as the joy of what I was experiencing soaked through my body. I was reliving it again. I was the luckiest girl in the world! It’s amazing how those little pleasures stay with me. Even today when I head down to the Dairy Queen I’m reminded of the big cow’s head that stood on Mack Avenue in Detroit. We went to that ice cream shop at least 20 times a summer, maybe more. We sang the ice cream song, “ I got some ice cream.” This song was made even funnier when I think of the comedian Eddie Murphy’s recreating how every child feels once they get some ice cream and then they sing this song too vigorously and the ice cream ends up on the ground. Hilarious! I’m always excited every summer when from seemingly out of nowhere, I get a whiff of a smell and it teleports me back to those summers past. Sometimes I can even identify where I smelled it and what I was doing. Smells of certain spices brings with them Grandma cooking Scrapple in Philadelphia. I see images of Grandma’s blue hair and big bosom. There are fireflies, butter cups and memories of catching tadpoles near the train tracks. I believe that the people that are no longer in our lives are entrenched in our memories. These memories are brought back to life when we allow ourselves to relax enough to trace the smells in our present, back to our past. The bundled memories of the people we love who are now riding the winds in the air and in our minds, bring us energy to remember them by. Our ancestors are stirring the pot in a heavenly kitchen, releasing the smells and sounds to keep us woke to their memory. Gifts from The Source. Memories that will last forever. I love the summertime.